Should I call them Nigeria's bravest boys or the most deluded youths of this Federation? Or place them in between? I really don't know but I am hoping that by the time you finish reading this, you will help me out. 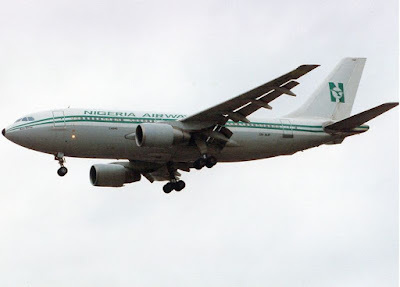 On the 25th of October, 1993, there was a fantastic drama high up in the skies of Nigeria. 30,000 feet above sea level, a commotion was in play. Four young Nigerian men (one of whom was a teenager) had hijacked an aircraft belonging to the Nigerian Airways with a toy gun, four litres of petrol and knives. The nation was spellbound and the entire world shifted its focus on the West African behemoth in a matter of minutes. The New York Times ran away with the news spreading the buzz of the four men while the Nigerian press went gaga. Rumour mongers had a field day spinning all sorts of tales. Coming at a time when there was a lot of political tension and social chaos in the land, many Nigerians were simply stunned while others stayed glued to their black-and-white TV sets, staring in disbelief. In no time, the hijackers had taken control of the aircraft, contacted the control tower, made confidently grand demands, held every single passenger on board hostage and threatened to set the aircraft on fire. No be shereshere o! But what actually happened on that Monday and what led to it? 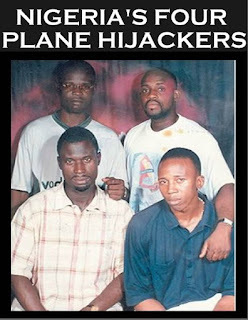 Let's go there...terror in the Nigerian skies, the scintillating story of the four hijackers. It was a big bird -an Airbus A310-200, a twin-engined widebody jet airliner (see pictures). The exact number of the passengers varies slightly depending on your source. But according to the New York Times, there were 159 passengers on board. Some other records indicated there were between 135-137 passengers inside the plane. The plane's flight was supposed to be from Lagos to Abuja, the Federal Capital Territory, a distance of about 509 kilometres. Inside the plane were top Nigerian government functionaries and businessmen off to Abuja for very important deals. Richard had just finished high school from Ondo State at that time and he was the one who got up first as the plane climbed and he approached the cockpit where he gave orders to the pilot and the co-pilot. You know, like a boss...lol! His father was arrested and detained by Abacha after the hijack and interrogated. Interestingly, Ogunderu was the youngest then, he was just 19. The second of the hijackers, Adenuga said they carried out the hijack ‘to show the resentment against annulment of the June 12 election.’ He is still sad that today, the system has not changed. Were their actions in vain? He was 22 years old. He was 24 years of age at that time. He was 23 at that time. For the four hijackers, they were obviously inexperienced with the dangerous art of hijacking and for some of them, that was the first time they would fly in a plane. According to Ogunderu, one of the four hijackers, the air hostesses were visibly frozen with fear and the terror in the faces was clearly palpable. O’boy, if na you too nko…lol! Ta lo ma ri iku to ma ping? LOL! They were threatened and told not to move if they do not want to be killed. One of the passengers who was inside the aircraft lavatory kuku decided to stay locked inside until Ogunderu went inside and pulled him out of the toilet….lmao! Before landing in Niger, the aircraft made attempts to land in Ndjamena, the capital of Chad, and then head for Germany but were unsuccessful. Upon being diverted to Diori Hamani International Airport, Niamey, Niger Republic where they arrived in less than two hours later for refuelling. As they were landing in Niamey, Nigerien commandoes armed to the teeth were already on ground waiting for them and they could see them from the aircraft windows. It is amazing to know that some of those released were the Vice President of China, Rong Yiren. Then the hijackers dropped the bombshell: they would burn down the aircraft within 72 hours should the Nigerian authorities refuse to accede to their demands. Una see sey e don tey wey FG don dey enter kasala. But what were their demand(s)? -They also demanded that press freedom in Nigeria be guaranteed and that General Ibrahim Babangida be prosecuted on corruption charges. -That ‘looters’ of the economy which “included 3,000 government officials who stashed away $33 billion in Swiss accounts” be fished out and all prosecuted. -The probe of the September 26, 1992 mysterious crash of the Nigerian Air Force C-130 Hercules transport plane in Ejigbo, Lagos where an entire batch of some of Nigeria’s most intelligent military officers perished. -Full probe into the death of Dele Giwa, Nigeria’s foremost journalist who was blown to smithereens in October 1986 in Nigeria’s first parcel bomb attack. You know the most interesting thing? The questions remain unanswered even decades after the events. Kept inside the aircraft to witness all the horror as it played out were six officials of the Nigerian government and the six terrified crew members. On the 27th of October, the National Assembly called an emergency meeting and on the 28th, the Nigerian government gave orders for the aircraft to be stormed. Gegeun! Aptor and Bossi! LOL! In the dead of the night, Nigerien commandoes, assuming the hijackers would be asleep stormed the Nigerian Airways aircraft. It was not funny. They bombarded the plane, fired at the hijackers and successfully captured the four of them, their arms were flung to their backs, shiny handcuffs were produced and they would start their long journey into captivity. But it would not come cheap. In the ensuing fracas, one person died (the co-pilot was killed during the operation), a member of the crew, five other passengers and one of the hijackers were all injured. At the end of the operation, all the four hijackers were captured. Lobatan. Later on, the hijackers would say that they were not afraid when forces stormed the aircraft. After days of negotiation, the gunmen freed all the passengers -except 39 who were kept as hostages after two hours of negotiating with government officials. The government of Niger Republic had to take it slow and steady as they were not too sure of how well-armed the hijackers were, whether they had explosives on board and the rest. They baited the hijackers promising them freedom if they do not harm any of the passengers but at the same time, secret meetings were being held by Niger’s security chiefs on how to storm the aircraft and even kill the hijackers if need be. MAD was formed in 1992 and the hijackers refused to name their sponsors (if any) or reveal the exact details of the hijack or their modus operandi. But they all claimed to have been motivated by the events of June 12. MAD was led by Mallam Jerry Yusuf from Offa, Kwara State. He was 42 at that time but today, he seems to have disappeared from the radar. Before the hijack in 1993, MAD was already organizing protests against the brutal regime of Nigeria’s military president, General Ibrahim Badamasi Babangida. They organized seminars and conferences at the National Theater, Iganmu, Lagos where they lashed out against the IBB regime. After the hijack, Mallam Yusuf, the leader of MAD said that they did so to ‘terrorize the few people who have terrorized us politically and economically, to recover the money stolen from us.’ Yusuf was born in Offa, Kwara State in 1952 and lived in Germany between 1973 and 1977, during which he was believed to have learnt German. He studied fundamental Islam and was also a businessman dealing in the sale of cocoa. After the hijack, he was picked up on the streets of Ilorin by secret operatives on his trail and handed over secretly to the Nigerien authorities even without any extradition request. Then, he was clamped into jail and throughout 1995, he was in Kollo with the four hijackers, his followers. Yusuf once stated that he had the ‘antidote to coups’. He embarked on hunger strike to protest his ‘arbitary detention’ in Niger. Now, that’s some mad stuff! After the four hijackers were arrested, they were taken to the Kollo-Zarma Prison, 30 kilometres south of Niamey. In a desert nation like Niger, daytime temperature was unbearable as searing heat could reach 55oC. Ogunderu recalled their nasty experience: ‘We were poorly fed. We could neither speak Hausa nor French and nobody spoke English to us.’ Mahamane Ousmane, then the President of Niger had to go on TV to announce to his flabbergasted citizens that the situation was under control. Then Abacha took over and just three days after he came to office, the hunt started for the leader of MAD, Mallam Jerry Yusuff, the mastermind of the whole hijacking operation. Secret security agencies and outfits across Nigeria were tipped. Not long after, he was abducted on the streets of Ilorin and whisked away. He was told that he would be bundled to Abuja for interrogation, only for him to open his eyes and meet himself in Niamey, Niger…lol! His abduction was a clandestine operation planned and executed by the governments of Nigeria and Niger. In Niger Republic, the President slipped while meeting with Association Nigerienne Por La Defense Des Droits Dehomme, a human rights group that had visited the Nigerien President on behalf of the hijackers and mistakenly revealed that Yusuff was already detained in Niamey, thus causing a major legal tussle in the arid West African nation. Some argued that Yusuff committed no crime in Niger and should be held in the territory. As the legal fireworks continued, Yusuff and his cohorts languished in jail. While in prison, they had to contend with hunger atimes, heat, death threats, total lack of communication with their relatives and a culture that is totally alien to theirs. For nine long years and four months. But you know the interesting part? They never gave up. Richard took to learning French which he now speaks fluently but he said he is frustrated that he cannot find a job in Nigeria after his release (that was as at 2011). 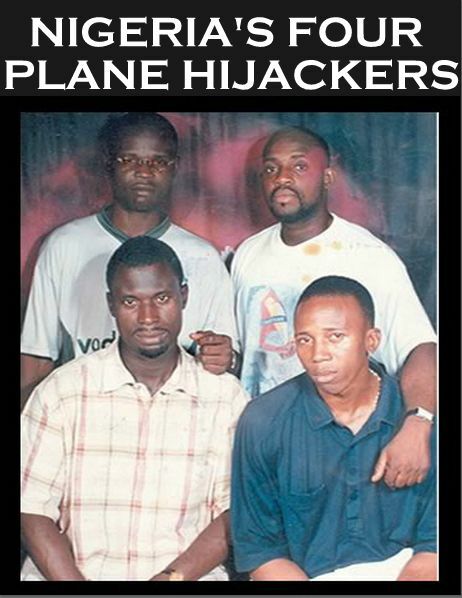 During an anniversary to celebrate the founding of MAD, the hijackers apologised to all Nigerians. Ogunderu, leader of the hijackers said before an international press conference in Lagos: Our intention was not to harm anybody and that they were not terrorist neither were they sponsored by any foeign body, but were energetic young men,full of ideas and burning with the desire to save millions of Nigerians from the trauma that the annullment of June 12 election had foist, a decison to decisively intervene with the view to bringing the crisis to an end.” During the event, he also blasted the Nigerian airport security officials who did not detect a thing while they all boarded like innocent passengers with all their weapons. He stated that they never made any material demands from the passengers. They were released from prison in Niamey on the 2nd of January, 2002.